Box Text: A world in conflict. An enemy to be reckoned with. A ace pilot read to take command. Strap yourself into the cockpit and prepare for supersonic excitement. This world is at war and your dog-fighting skills will be put to the test. 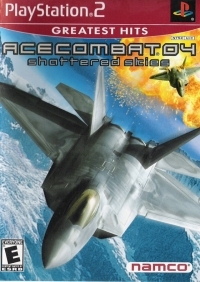 It's time to experience the turn and burn action that only Ace Combat 04: Shattered Skies can deliver, from the crushing G-forces, to the non-stop aerial sorties. Find your target and lock on... you have permission to fire! 07-01-2013 shoujogamer Box Text Strap yourself to the cockpit and prepare for supersonic excitement. The world is at war and your dog-fighting skills will be put to the test. 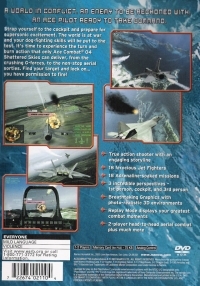 It's time to experience the turn and burn action that only Ace CombatÂ® 04 Shattered Skies can deliver, from the the crushing G-forces to the non-stop aerial sorties. Find your target and lock on...you have permission to fire! 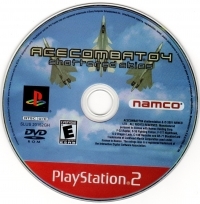 This is a list of VGCollect users who have Ace Combat 04: Shattered Skies - Greatest Hits in their Collection. This is a list of VGCollect users who have Ace Combat 04: Shattered Skies - Greatest Hits in their Sell List. This is a list of VGCollect users who have Ace Combat 04: Shattered Skies - Greatest Hits in their Wish List.